We will say that there are three subjects here: the steel one, floating at the center, and to either side of it two dark structures, both made of wood: the Oriental Pier on the right and the Bell Street trestle on the left. The date for this look north on the waterfront from the Virginia Street Pier is probably 1910. That was the last year for the temporary Bell St. trestle, which was extended into the bay to carry thru a flume most of Denny Hill. By aiming powerful water canons at the hill it was transformed into flowing mud and carried far off shore. 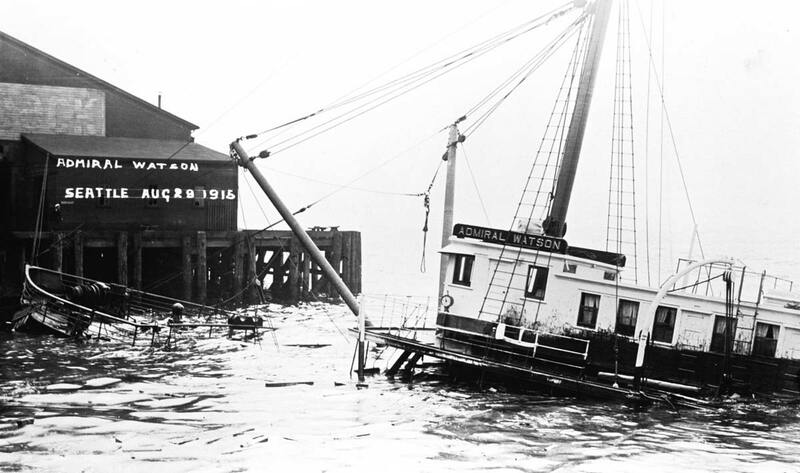 Launched in the east in 1901 the Watson was brought around in 1905 and worked the West Coast on various packets between Puget Sound and San Francisco and also to Alaska until it was sold to Japanese shipbreakers in 1934. 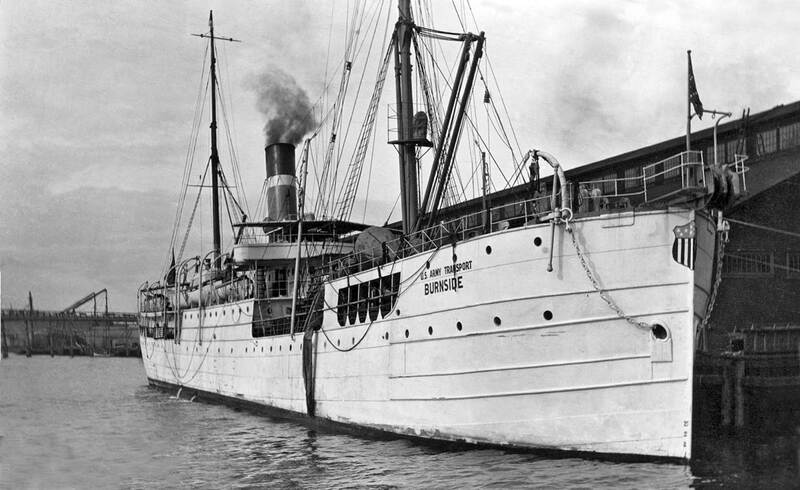 Except for this 1915 accident and a temporary stranding in 1910 on Waada Island off Neah Bay the Admiral Watson with its 135 first-class accommodations, six deluxe suites, and 150 beds in steerage was a very safe and serviceable passenger steamer. 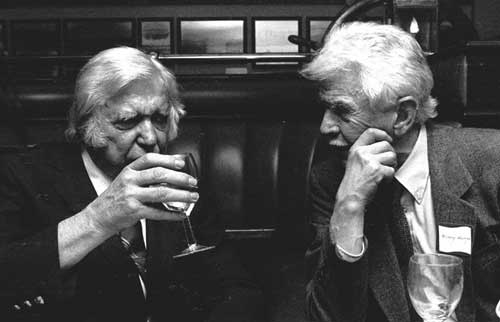 Another view of the Watson above, not to be confused with Emmett Watson, below left, conversing with Murray Morgan, the “dean of Northwest historians,” at the re-opening of the Ivar’s Acres of Clams on Pier 54 “at the foot of Madison” in 1987 – I believe. I snapped the bottom shot. 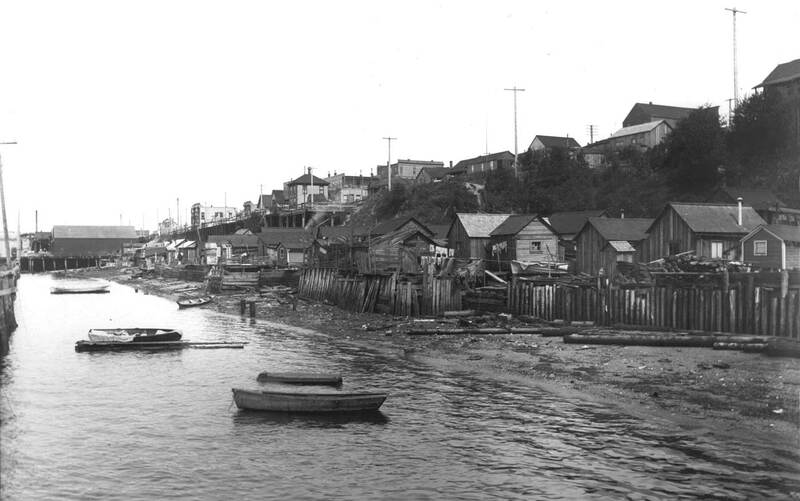 In the 1890s the waterfront from Pike Street north to Broad Street was developed into a community of shacks made from scrounged materials, including those deposited by the tides. There was only one break in the bluff separating this squatter’s strip from their Denny Hill & Belltown neighbors above them. The north entrance to this “Belltown ravine” shows on the far left of a scene recorded from the Great Northern RR trestle in 1898 or 99 by the Norwegian photographer, Anders Wilse. North of Bell Street a lower bluff resumed and petered away by Broad Street. Here the entrance to the ravine is crowded with the waterfront’s most ambitious grouping of shacks, appointed with their own seawall and flagpole. 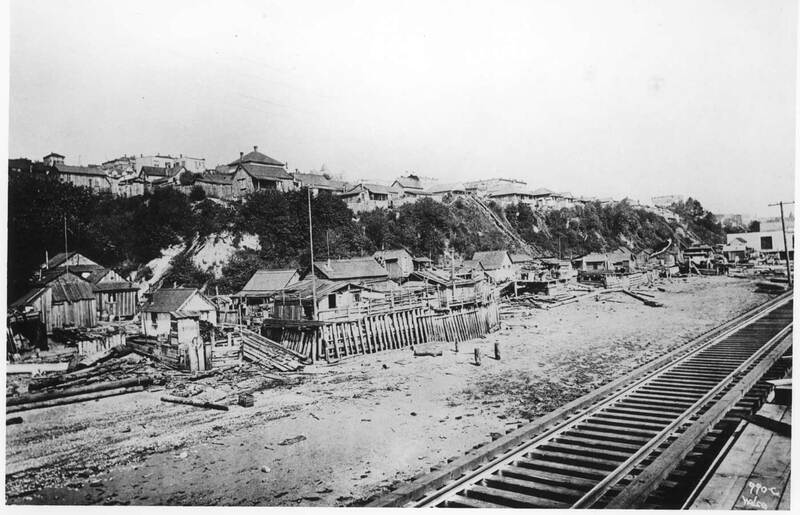 Beginning in 1903, however, construction of the north approach to the Great Northern tunnel beneath the city uprooted this beach community, replacing it with more tracks and fill. Soon the ravine was also filled with Denny Hill dirt that included at least one native skeleton that was discovered at this site during foundation work on the Port of Seattle’s World Trade Center. This time looking north through the same section of squatters shacks, and also photographed from the railroad trestle near the foot of Lenora, ca. 1901. 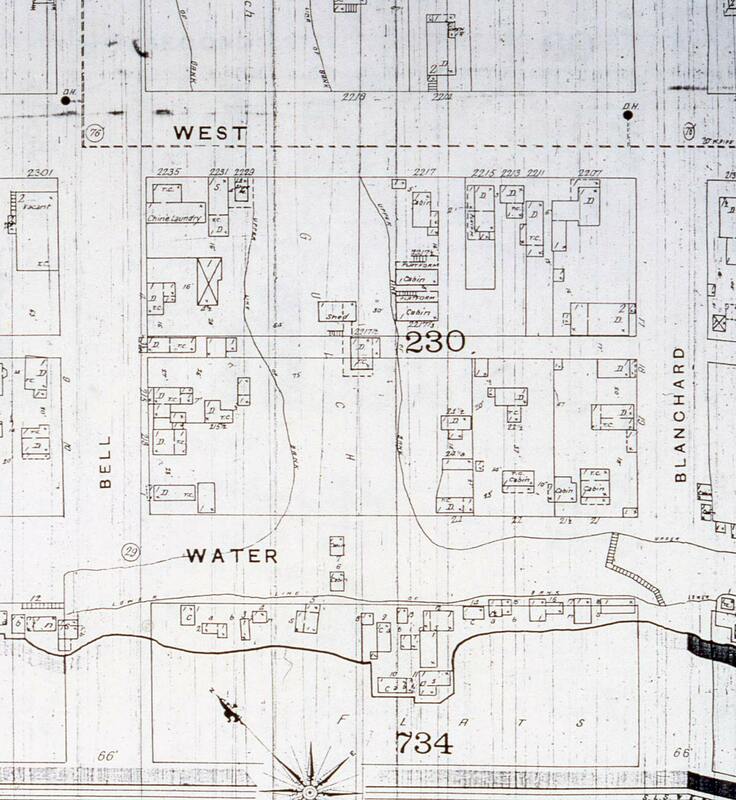 A footprint of some of the same beach neighborhood earlier in 1893. The incursion of the Belltown Ravine can be followed with the map's topo lines. Dugouts pass off-shore Belltown and the long Orient(al) Pier at the foot of Lenora. A scene from one the Golden Potlatch celebrations staged in the summers of 1911, 1912 and 1913. The two 'scrapers on the horizon are the New Washington Hotel at Second and Steward and the "Your Credit is Good" Schoenfeld's Standard Furniture store at the northwest corner of Second and Pine, now the Rack or the Shelf or the Gap or the Closet or the Nook & Cranny. Railroad Avenue mess looking north from near Lenora Street. The Oriental longitudinal pier is out of frame to the left. The Denny Regrade flume crosses the scene about two blocks to the north. The spur to the Great Northern's tunnel under the city is hidden behind the sheds on the right. The Japanese steamer Tacoma Maru is tied here to the Gaffney Dock (now the big shedless wooden pier at the foot of Virginia Street where Summer Nights at or on the Pier once made great joyful noises). The view looks north from the Pike Street Terminal ca. 1911. Built in 1909 for the Osaka Steamship Company, the Tacoma Maru managed in its 35 years afloat to get around. In 1910 it delivered English missionaries to Tristan du Cunha, the "most remote settlement on earth," and in 1942 it carried 1,600 prisoners - most of them English - north from Java to work on the Thai/Burma railway. In 1944, the Tacoma Maru met up with the USS Hake. The submarine came upon three Japanese vessels on the first of February. A recounting reads, "With the three targets in a line of bearing after a perfect approach, the submarine launched a spread of six torpedoes, sinking two fo the three, Tacoma Maru and Nanka Maru. The attack achieved complete surprise and the Hake was not attacked by the screening vessels." A portion of the Denny Regrade trestle appears beyond the vessel. A revealing look at the spouting flume. Beside it is the U.S.S. Monitor. The Denny Regrade's Bell Street flume seen from West Seattle's Duwamish Head. Bell Street is at the scene's center. Much of the Belltown Ravine to the right (south) of the street has been filled in. Blanchard Street is far right, and Battery Street on the left. Note the several arms of the flume, which after it poured enough of Denny Hill off the end of any digit of its extended "hand" would drive more pilings to carry the mud further into the bay. Eventually this underwater reconstruction of Denny High climbed so high from the bottom of the bay that it became a "danger to shipping" and was dredged. The "next regrade" as seen, again, from West Seattle. Here Elliott Avenue has been filled and extended between Bell and Lenora Streets. A corner of Queen Anne Hill appears upper-left. The Belltown Skyline completes the horizon. It includes, right to left, the Sacred Heart parish at 6th and Blanchard, the Denny School (with the tower near the center) at the northeast corner of Battery and 5th Avenue, the Masonic Lodge and the Bell Hotel (at the southeast corner of Battery and First), left of center. Note the long Oriental pier center-right, both the Virginia Street and Gaffney Piers on the right. The date is circa 1913. 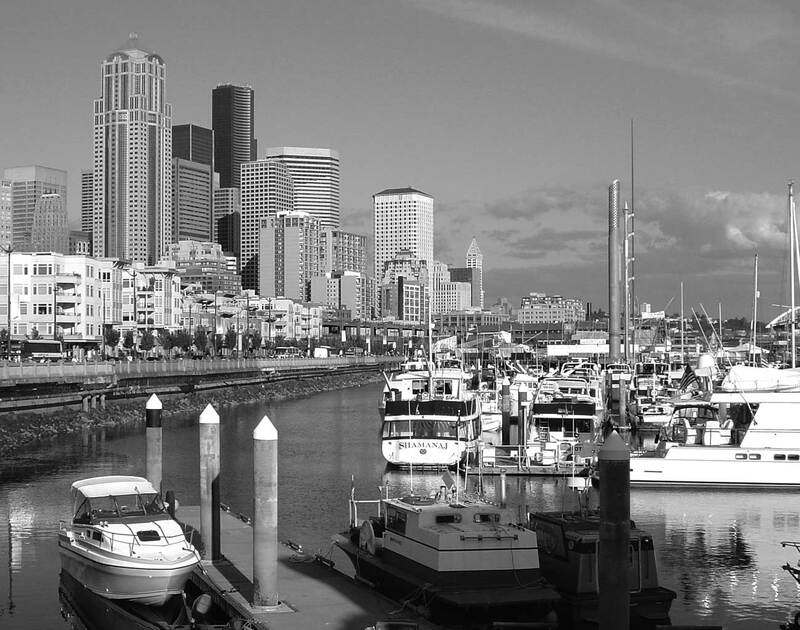 Following the extended commotion surrounding the gold rush of the late 1890s the Seattle waterfront settled into vocational routines that located much of the fish-processing north from and including the Pike Street. South of the Pike Street dock as far as King Street the central waterfront was used generally for transportation and shipping of all sorts. 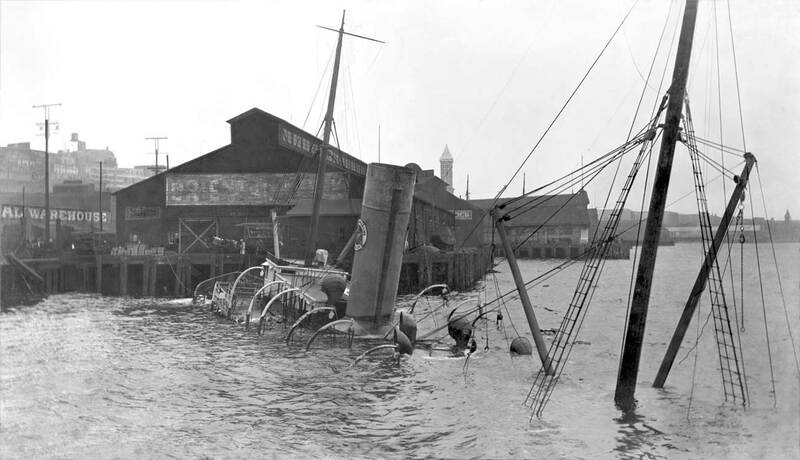 Not surprisingly many of the longer finger piers there – between piers 46 and 58 – were owned by railroads. Both these “now & then” look north from the second floor of Pier 59 (at the foot of Pike Street). 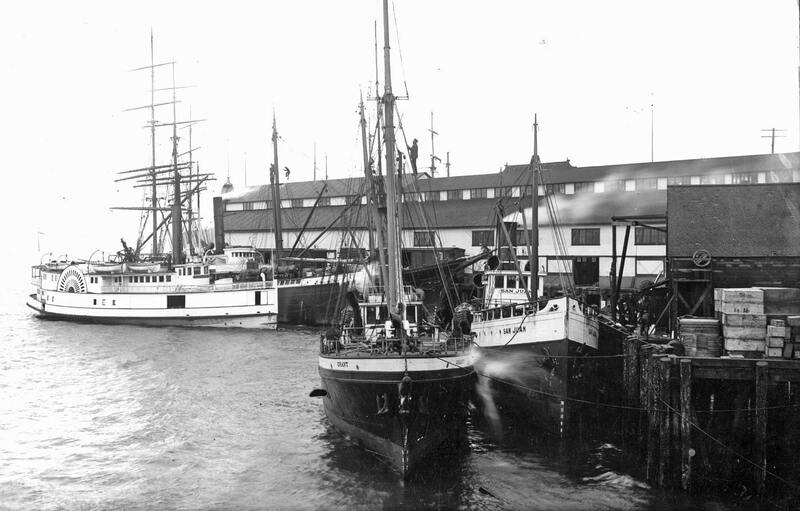 In the early 20th century scene Pier 62 – the Gaffney Dock – blocks the view beyond Pine Street. 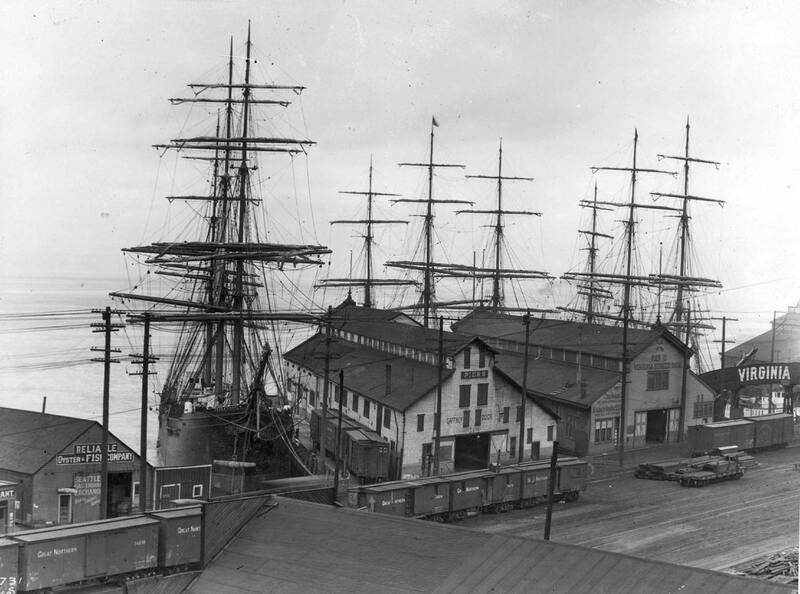 The short pier of the San Juan Fish Company is on the far right and berthed beside it are the company halibut steamers the Grant, at the center of the photograph, and the San Juan. The name was borrowed from the islands where James E. Davis, one of the company’s partners, was born in 1871, the first child born to any settler on Lopez Island it was claimed. One of the venerable old plows on Puget Sound is on the left – the 154-ft. side-wheeler Geo. E. Starr. When launched near the foot of Cherry Street in 1879 she was the largest vessel built on Puget Sound. 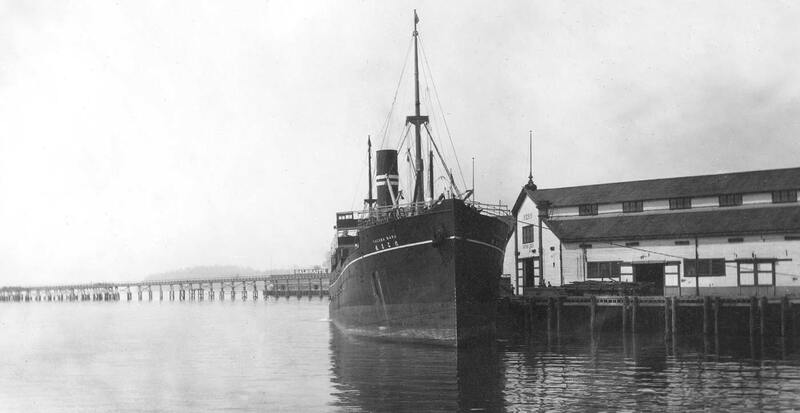 When she retired in 1911 the Starr was tied off shore to a buoy in Elliott Bay to store dynamite. When the “container revolution” revised the Port’s post-war vision the old working central waterfront turned increasingly to play. 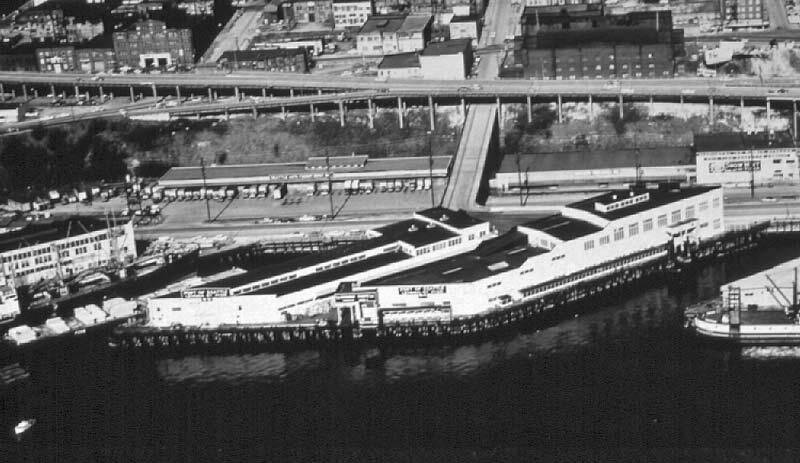 In 1975 Pier 60 was demolished for construction of the Seattle Aquarium. In the 1980s the pier sheds on the Gaffney dock and its neighbor the Virginia Street pier were razed to make room eventually for summer concerts. And in the 1990s a long quay was at last built. North – not south — of Lenora Street it was designed primarily for tour ships. (CLICK twice TO ENLARGE) Post-war (1946) newspaper clipping announcing the Port of Seattle's plan to build longitudinal piers along the waterfront south from the Port's own headquarters at Pier 66, Bell Street. (Click TWICE to enlarge) A piece of the Pacific Coast Oriental Pier on the left with the Virginia Street and Gaffney piers at the center. 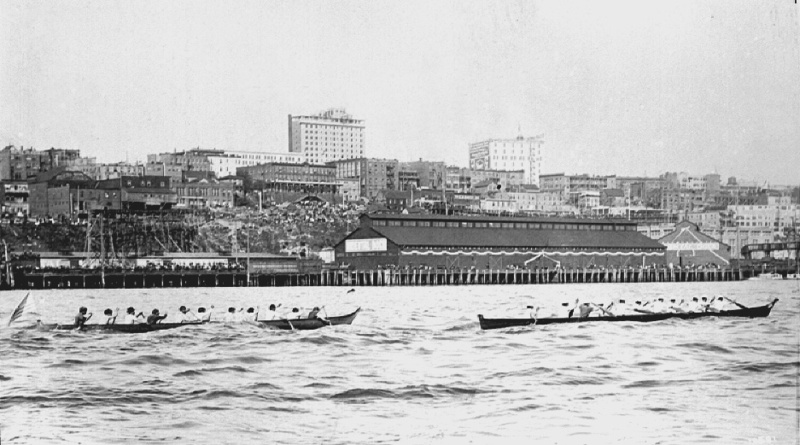 The fish piers to the right of them are mostly hidden behind the iron tramp steamer, and the New Washington Hotel is at the top center horizon, ca.1911. The nearly new Lenora Street overpass crosses through this revealing look south from the Bell Street overpass. 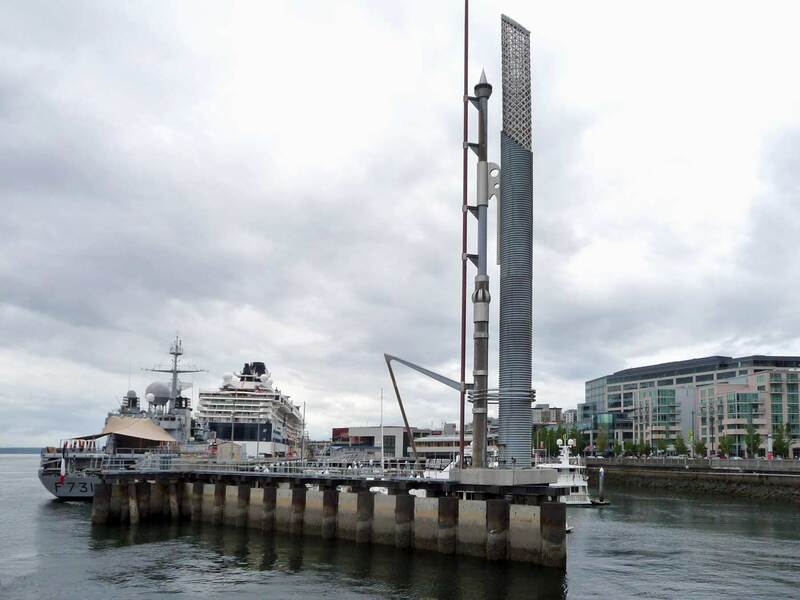 It was attached to the Port's Pier 66 headquarters and wharf. 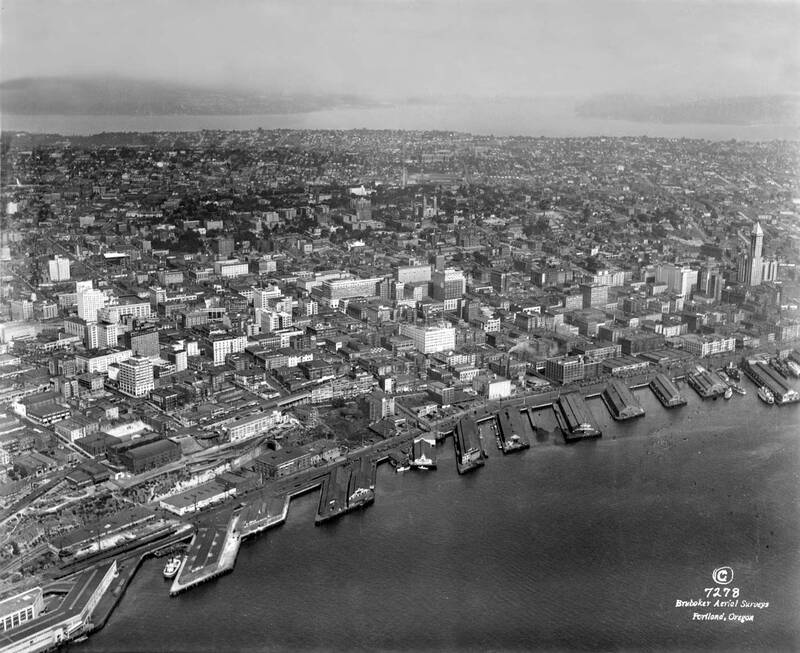 Note the Armory on the upper left and a glimpse at the crown of the Northern Life Tower (Seattle Tower), 1928, at the center horizon. The Smith Tower surmounts all on the far right. The scene dates from 1930.
ca. 1960 aerial over the Lenora Street Wharf, which replaced the Oriental Pier in the 1920s. 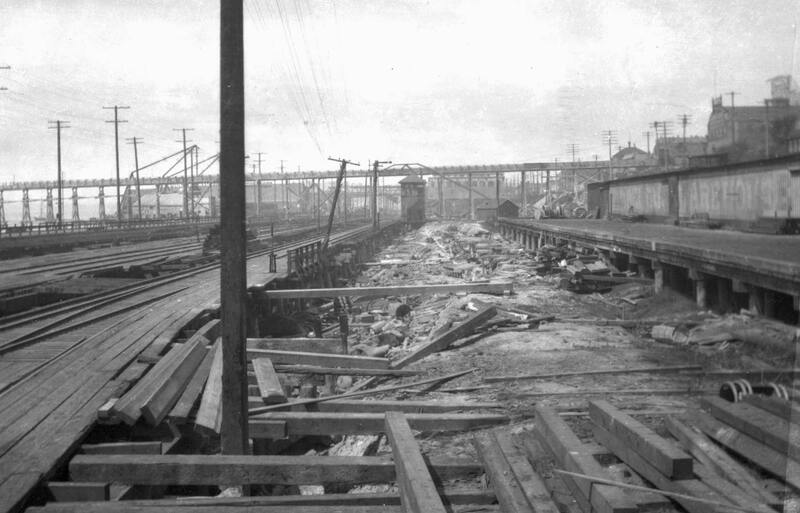 The Port's Bell Street Terminal is on the left, and the Virginia Street Dock (stuffed with newsprint) on the right. The Armory on Western Ave. shows upper-right. 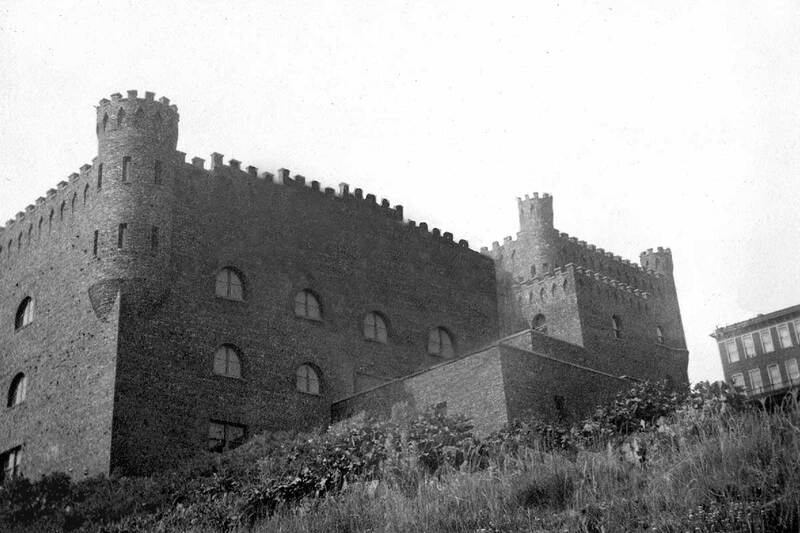 From this prospect on the bluff below its battlements the military lines and slotted towers of the old National Guard Armory on the slope of Denny Hill stood out like the bastion it was not. The architectural style was strictly high military kitsch. It stood on the west side of Western Avenue and filled most of the block between Virginia and Lenora Streets. 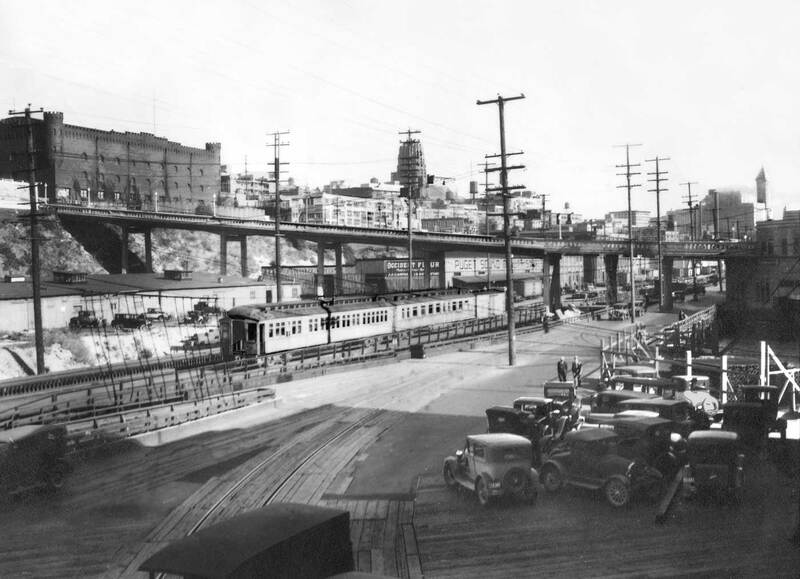 Now (top-right) from directly below, the site is hidden behind the Alaskan Way Viaduct and the railroad’s retaining wall that leads to the RR Tunnel’s north portal. Through the Armory’s 59 years the honeycomb of about 150 rooms within its 3-foot thick brick – about one million of them – walls saw more auto shows, conventions, athletics (in its own pool), and community services than it did military drills and standing guard in defense of Seattle. Built just north of the Pike Place Market on Western Avenue the armory was dedicated on April 1, 1909 or two years after the market opened. Hence, our 1908 view, bottom-left does not show it, while our 1910 view, bottom-middle, does. A month later during an indoor Seattle Athletic Club meet an overcrowded gallery collapsed maiming many and killing a few. The armory was outfitted with showers and free food services during the Great Depression of the 1930s, and during the ensuing Second World War it was used by both the Greater Seattle Defense Chest as a hospitality center for servicemen and by the Seattle General Depot as a warehouse. Earlier, in 1939, most of the military uses were transferred to the then new steam lined armory that survives as the Seattle Center Centerhouse. Following WW2 the state’s unemployment compensation offices were housed within these red walls. In April 1947 a fire that began in the basement furnace room swept through the state offices postponing the payment of nearly 2000 checks to the unemployed and veterans. With only two exits the building had already in 1927 been tagged as a firetrap, still it was repaired following the ’47 fire, but not following the larger fire of 1962 after which it was merely shored up. In the January 7, ’62 blaze much of the west wall fell on the northbound lanes of the Alaskan Way Viaduct knocking holes in its deck and cracking its supports. 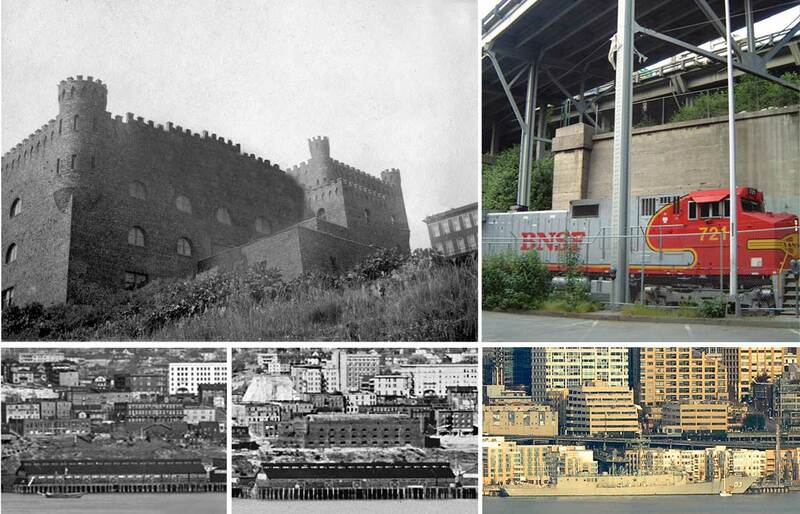 While asking to purchase the armory from the National Guard the Seattle City Council described its 1959 vision of the armory site that featured some combination of lookout park and garage but without the brick battlements. Nine years later when demolition expert John McFarland began tearing it down local preservationists, including architects Victor Steinbreuck, Fred Bassetti and Laurie Olin, put a temporary stop to it. The proposals that quickly followed featured either restoring what was left of the Armory for small shops or saving its “symbolic parts” including a surviving south wall turret for a lookout tower connected with the proposed park. Revealing a preservationist stripe of his own the contractor McFarland offered to save the armory’s grand arched entrance at his own expense. In this instance, however, the City Council turned a cold cheek to preservation from all quarters and instructed the wrecker to resume his wrecking. The Armory now-then runs across the top of this montage. Below it are three views of the site pulled from the panoramas taken from West Seattle and featured in extensio on our website Washington Then and Now. I give this aerial a circa date of 1926 - or perhaps '27. There certainly is enough evidence in it to peg the date probably to the year-month. This I have not done - yet. There is no 1928 Northern Life tower in it. No seawall construction south of Madison, surely. It reaches from the south end of the Bell Street Terminal, far left, to the Grand Trunk Pier at the foot of Marion/Madison, far right.